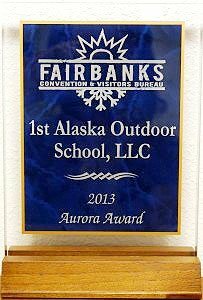 Best Alaska Dog Sledding and Dog Mushing experience. The only means of transportation through the snowy lands of old time Alaska. Today is a fascinating sport and hobby. Alaska Dog Sledding / Dog Mushing is an activity nobody should miss on an Alaska winter vacation. All our Alaska Dog Sledding / Dog Mushing Tours are designed into a spacious time frame. We do not hurry you in and out of the sled or run circles on a field but give you a real Dog Mushing experience on trails used by Alaskan mushers. There is plenty of time to make your favorite Dog Mushing pictures and play with our Alaska huskies. Blanket is provided for our Alaska Dog Sledding / Dog Mushing adventures. Break away, and mush with us into the twilight of the Alaskan wilderness. Please note we have a per person weight maximum of 250 pounds. Pick-up is provided from hotels in Fairbanks. Sven Haltmann grew up in a small mountain village in Switzerland. He quickly fell in love with the outdoors at a young age, while working on his grandparent’s small farm. Even though he lived in an Alpine oasis, Sven’s sense of adventure got the best of him and he set out to see the world. He worked as a tour guide throughout various Greek and Spanish Islands in his early twenties. With his winter employment uncertain, he decided to find a job in the “Last Frontier” and test his outdoor skills. Once in Alaska, Sven began to work with an Iditarod Champion. He helped train and care for over 80 dogs. Sven fell in love with mushing and realized this was his new calling and immigrated to Alaska. Working with these dogs made him want to run the Iditarod himself once day. Sven successfully achieved this goal 4 separate times between 2008 and 2011. In his last race attempt he finished 14. After his last race, Sven moved to a small bush village 35 miles north of the Arctic Circle to give tours to guests staying at Bettles Lodge. Sven enjoyed this new opportunity in tourism and saw that he could have a big future in the industry. In 2013, Sven’s company, Arctic Winter Adventures, teamed up with 1st Alaska Tours to provide guests top notch dog sled tours and aurora viewing adventures. Now located 30 minutes from Fairbanks Sven is able to fulfill thousands of people’s Alaska dreams. IMPORTANT : A minimum of 2 people is required for online booking. Single travelers and short notice reservations (within 7 days of tour date) always have to contact us for availability at info@1stAlaskaTours.com or 907-590-5900. QUESTIONS? PLEASE CONTACT US - Fragen? Sprechen Sie uns an.